Super views across town toward the Quantocks - 2 Double Bedrooms, Refitted Kitchen, Shower Room & Cloakroom, good size Lounge/Diner, Garage, Visitor Parking, Gas CH & DG. A modern purpose built 3rd floor flat set on the south west corner of this detached block. The accommodation briefly comprises refitted kitchen, shower room and cloakroom, good size lounge/diner, 2 double bedrooms and garage. The property enjoys gas central heating and UPVC double glazing affording views over the town and bay to the Quantock Hills beyond. COMMUNAL HALLWAY Door to Apartment 12. ENTRANCE HALL Coved ceiling, radiator, entry telephone, folding door to hanging storage space, double doors to part shelved AIRING CUPBOARD housing factory insulated tank and immersion. LOUNGE/DINER 24' 7" x 11' 11" (7.49m x 3.63m) narrowing to 10'5" (3.18m) to dining area. Coved ceiling, UPVC double glazed tilt'n'turn south facing window affording panoramic views over the town to Uphill hill and church, Brent Knoll, Weston Bay, Brean Down and Quantocks beyond, further UPVC double glazed eye level windows to westerly aspect and UPVC double glazed window to rear aspect, 2 double radiators, TV point..
REFITTED KITCHEN 10'3" x 8'6" (3.12 x 2.59m) max. Refitted with Beech effect units comprising 3 double and single wall units, single bowl single drainer stainless steel sink with sink tidy and mixer tap over, cupboard under, further base cupboards, 5 base drawers, roll edged worktops, integrated fridge and freezer integrated 4-ring halogen hob with electric oven below, washing machine, tile effect vinolay flooring, fully tiled walls, floor mounted gas fired boiler providing hot water and central heating, fluorescent strip light, UPVC double glazed south facing window affording views over the town and bay to Brean Down and the Quantocks beyond. BEDROOM 1 11' 10" x 10' 11" (3.61m x 3.33m) Built-in wardrobes, radiator and UPVC double glazed window to rear. 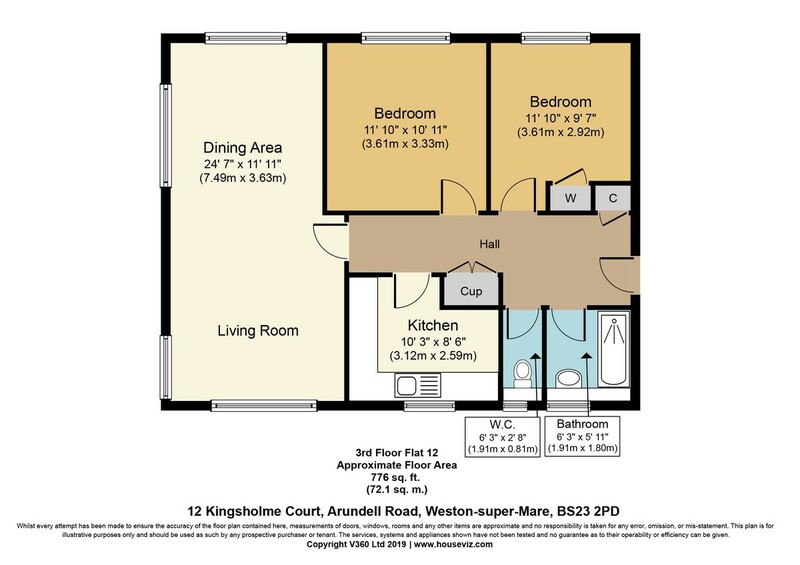 BEDROOM 2 10' 0" x 9' 7" (3.05m x 2.92m) Plus door recess and built-in wardrobe, radiator, UPVC double glazed window to rear. CLOAKROOM White low-level WC, tile effect vinolay flooring, UPVC obscure double glazed window. SHOWER ROOM Refitted with white suite comprising; walk-in double shower cubicle with mains mixer shower unit, pedestal wash hand basin, fully tiled walls, radiator, tile effect vinolay flooring, UPVC obscure double glazed window. OUTSIDE GARAGE (No. 6) in block with up-and-over door.